If you haven’t noticed, we’re very excited about the 2016 Chevrolet Camaro at The News Wheel. We’re getting closer and closer to the redesigned muscle car arriving in dealerships this fall, and General Motors is putting the pedal to the metal in its preparation for the launch. It was announced earlier this year that the Lansing Grand River Assembly Plant in Michigan would be adding a second shift to handle the anticipated volume of Camaro orders. The new employees will also be assisting with the Cadillac models assembled at the same plant. The 2016 Chevrolet Camaro is currently in pre-production, which means that the Camaros rolling off of the assembly line are destined for crash tests and other final checks from Chevrolet. 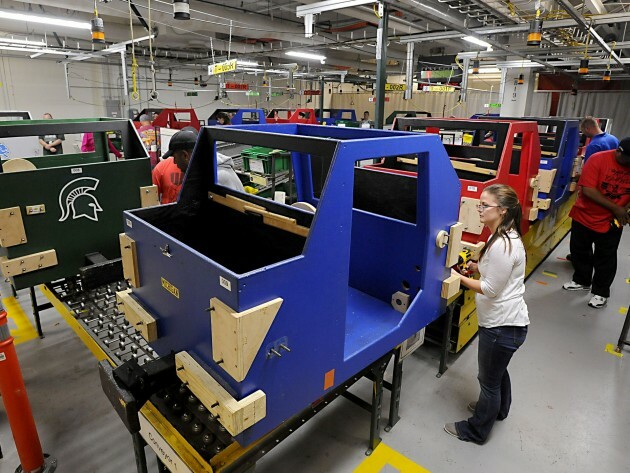 To be prepared for the production run, the new factory workers are training by assembling wood cars using similar tools that they will be utilizing on the line. Working in a plant that builds Camaros and Cadillacs means that factory workers will come into contact with cars on a regular basis that will be sold for more than $70,000, which means they need to come off of the line in perfect condition. Trainees are being conditioned to treat the cars that are being assembled with care and to get their tasks completed as efficiently as possible to help the production stay on schedule. The simulations have also taught trainees when to pull the Andon cord to pause the line and allow for more time in a process to make sure it’s done right. In the first practice run through, the Lansing State Journal reported that of the 15 cars built, 14 had defects. However, journalist Alexander Alusheff is quick to point out that he was included in that test run, and most of the defects were his. We’re sure the same thing would happen if we were sent out to build the cars we write about.